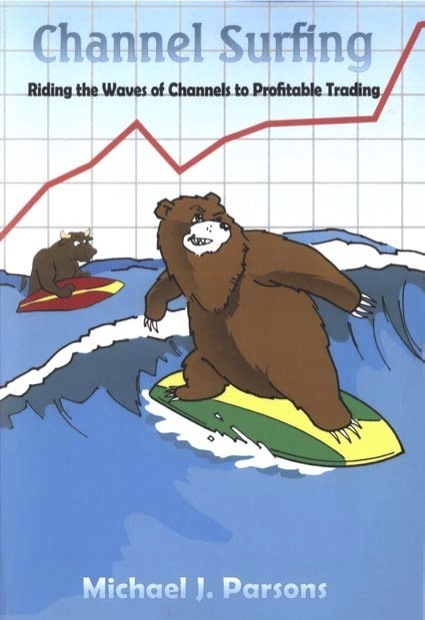 My wave counts are NOT Elliott Wave. Read about my unorthodox wave counting at . . .
See My Charts for possible wave counts and lots of indicators at . 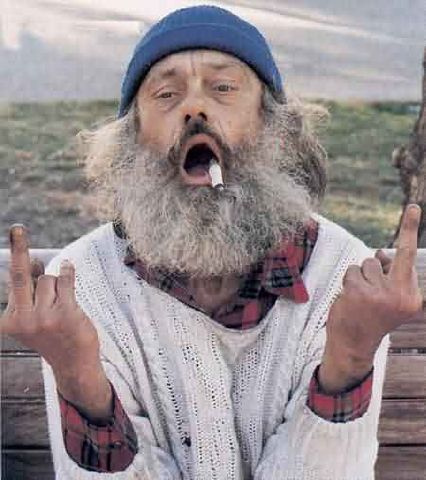 . .
My tweets are frequent and my blogs are infrequent. Tweets will often contain links to charts. Stay up to date and read . . . Comparing the above two variation of the SSI, there is a difference currently between the two charts. Sometimes the difference is quite significant, making one wonder how such dissimilar charts can come from the same basic process. SSI.1 and SSI.2 are usually saying the same thing, but there can be a big difference in the magnitude of what’s being said. In the DJ Industrials price chart, DJI $, there are 3 recent peaks and bottoms. This was possibly a 3 step correction (or 3 peaks, the jury is still out on this one). The correction in prices produced hardly a hiccup in the DJI SSI.2 uptrend. This is an example of how the SSI can make new highs before prices. DJI SSI.1 looks like it is still recovering from the recent 3 steps down. It doesn’t have the same vitality shown in DJI SSI.2. Until DJI SSI.1 makes significant new highs, there is a contradiction in effect. The difference shown between the DJ Transportation SSIs is that DJT SSI.2 doesn’t show a recent correction like DJT SSI.1. The correction in DJT SSI.1 began with a flattening on the second price peak (DJT$) and a lower low on the 3rd price peak. Both SSIs have resumed a steady uptrend with new highs. DJT SSI.2 made new highs prior to DJT$. The DJU$ chart is in an obvious correction after a vigorous rally. The DJU SSI.1 chart verifies the correction and shows lower lows while the DJU$ is presently making higher lows. DJU SSI.2 has made marginal new highs while prices have not made a higher high. DJU SSI.1 is possibly still stuck in a downtrend. Did you read Edson Gould’s article on utilities in the prior blog update??? These charts present the possible tie-in that I alluded to in that update. “If” we have a peak in the utilities, the timing correlation to the industrials can vary considerably from days to months. One observation that drew my focus is that the DJI, DJT and DJU SSI.2 charts are all in rally phase while their brethren, SSI.1, are still correcting or lagging behind. We need to watch and see if the SSI.1 will catch up and verify the SSI.2 later. In the past, I have relied more on the SSI.1 for the trend due to its construction. But the SSI.2 can be very useful for verification, or early indication of a new trend. Early indication of trend can be particularly valuable, but at what point does it get carried away reflecting excesses in the market?? I don’t have a good answer for that one, but we’ll see how it performs in the future in this bull market. Often times for a resolution of these conflicts, I will compare the charts and use the SSIs for a verification of my wave counts. You can do this yourself by printing each charts in landscape orientation (creates a larger chart) and then comparing directly (one precisely atop the other) and then holding them to the light. The overlay comparison “may” answer some wave count questions and trend vitality. 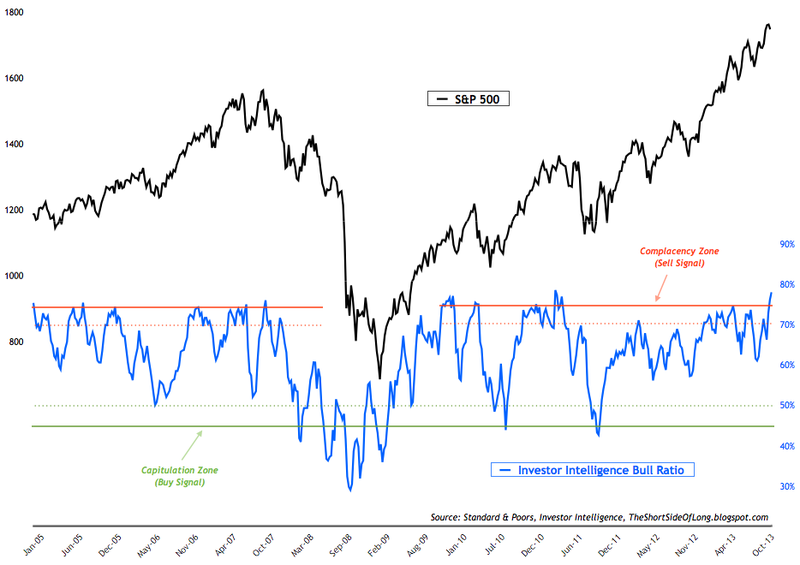 The SSI is not infallible, witness the DJ Industrials SSI.1 in 2007 (see a prior blog update for charts). The DJI SSI.1 didn’t give the same warnings as the transports and utilities. The obvious lesson is that you must watch all of the SSIs. Even with computers, the SSI calculation is not a simple process. It requires extensive data entry, data manipulation plus other boring procedures. Macros in Excel help, but they can’t do every thing. I’ve tried to create a single macro, but due to occasional variability (column additions, missing data or data errors, etc), it doesn’t work reliably. My object is to post the SSIs as we approach the 54 month cyclical low, which may be July 2014. Keep in mind that a cyclical low of such magnitude (54 months) can have a larger date error and may move months forward or backward before bottoming. Presently this cycle is busy moving further out in time. It originally had a bottom projection of October to January. See the following section for the new projection. 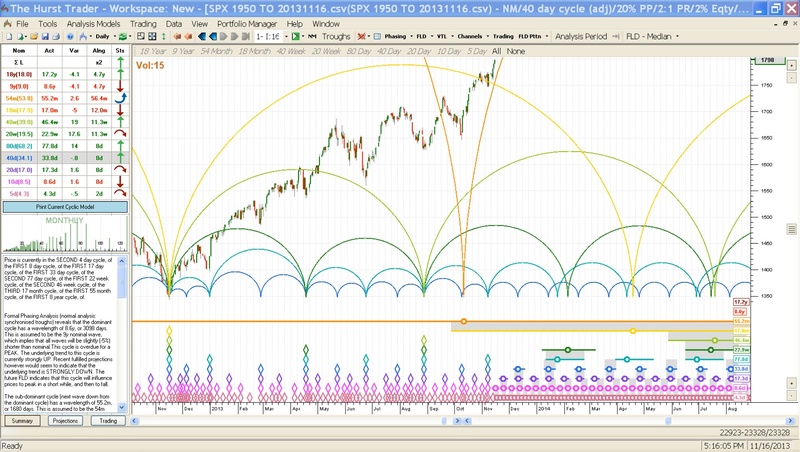 The above chart shows the 54 month cycle was targeted for October 2013. It’s the orange cycle semi-circle that shoots almost straight up. The 17 month cycle is scheduled to bottom in April 2014. Some smaller cycles are bottoming around July 2014. All of these cycles have to bottom at the same time so there will be a common cyclic bottom. Possibly some of the smaller cycles will provide a clue to the 54 month low. Obviously we have to peak before we can start looking for a bottom date and that just isn’t happening yet. The 54 month cycle is one of the big Kahunas in cycles, so it “should” make itself felt. But . . . if the 54 month cycle were to sneak by without much fanfare (did it happen in Oct 2013??? ), that would mean a larger cycle than 54 months is dominating the trend. The next larger is the 8.6 year cycle. If this cycle (8.6 years) has not peaked, this would be exceptionally bullish. There is no disputing the fact that the 54 month cycle has been on the cyclic downside for 27 months and it accelerates down as it draws nearer the projected bottom date. But its cyclic downside has had no effect on the market’s ability to produce new all-time highs. Interesting!!! The last time we had a nullified 54 month cycle was during the 1990s. The 54 month cycle last bottomed in March 2009. All of this makes me wonder . . . What the hell is going on??? A repeat of the 1990s would mean I will lose track of the wave count due to constant subdivisions. It’s possible that’s happening and we should have an answer in the next few months (or earlier). Remember, I haven’t capitulated on the wave count and lost track. I’m just thinking and posting a possible supposition. The rule is when you lose track of the count, ride this sucker until its gone too far to be reasonable and craziness is the rule (remember 1999?). The channel becomes the determining force for the end of the bull market as it is always the final arbiter for the wave count. I have mentioned that I had an alternate scenario for this bull market to continue for a longer period of time, but this is not the scenario. We’ll just have to wait and see what type of peak we get in the next few months. This is not the time to get crazy and pour money into the market as that’s exactly what the public is doing at the moment. Patience is something that MUST be learned to be successful in the stock market. I know its hard and I’m subjected to the same emotional urges as everyone else, but experience has taught me to use tactics to fit the situation until answers are forthcoming. Presently I’m trading the minor trends and surfing the smaller channels. It’s only $3.49 for the Kindle. Now that’s a bargain. After making some mistakes in the market this year, I’m trying to figure out how to rectify them. This entry was posted on November 19, 2013 at 12:06 PM and is filed under CYCLES, SUPER SECRET INDICATOR, UPDATE. You can subscribe via RSS 2.0 feed to this post's comments. You can comment below, or link to this permanent URL from your own site.